The objective of the book is not to dwell on specific events, chronicle the Summer or Winter Olympics, focus on individual athletic achievements, nor refer to distinct athletic achievements by Olympians (too numerous and too significant for just a mere reference). Marios Kallitsis, an outstanding artist, designed the cover of the book and so accurately captured the connotation of the title. Having Past and Present represented by Myron’s Discus Thrower rising above the contemporary runners, and the Future so beautifully portrayed by the colors of the five links -which symbolize unity and continuity. 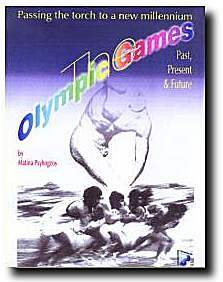 to retrospect the origin of the Games and contemplate their future. to be animated and inspired, each of us, to make every possible effort to protect and safeguard the lofty concepts of the Olympic Games and steadfastly hand them over to subsequent generations. The Torch is passed to a new millennium, let us celebrate! !..